From humble beginnings to, well… humble endings. This is a story of football’s wannabes, nearly men and might have beens – and there are a lot more of them than the David Beckhams, Wayne Rooneys and Steven Gerrards of this world. For thousands of football-mad kids over the years, who stood on the starting line in the race to become professional footballers alongside future internationals and household names, their story wasn’t quite the same. The bookshop shelves are full of biographies and auto-biographies of the great players of the present and the past who graced our national sport at its pinnacle. But what of the young hopefuls who only got a toe onto the first rung of the football ladder and managed merely a worms-eye view of the beautiful game? Theirs is the forgotten story that is never heard, but is equally relevant because, just as the stars of the game emerged from the same working class roots to portray the glamour and fulfilment of their dreams, the kids who didn’t make the grade provide a very different picture. However, their story contains just as much bravery, honest toil, commitment, joy and heartache. 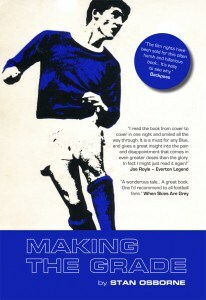 This book harks back to 1969/70, a very different era; an era before multi million pound transfer deals and contracts. Before the advent of the Premier League, Sky Sports and billionaire club owners. It looks back to a more innocent time when it felt as if football clubs and their stars still belonged to the fans instead of being at the mercy of players’ agents and foreign takeovers. This is an account of my brief experience as one of the young hopefuls at Everton Football Club during that era, but it could just as well be about any kid who started off with the footballing world at their feet, but just like the vast majority of other fledgling professional players, ended up with the weight of the world on their shoulders. This is a football story first and foremost, but as any ex-pro or apprentice pro of a certain age will tell you, actually making the grade in those days was about a lot more than just playing football. Making the grade then was just as much to do with coping with the minutiae of the ‘upstairs, downstairs’ life as a young footballer and the unexpected challenges, disappointments and knock about humour you were subjected to and the help, compassion and support, often from the most unlikely of sources, which enabled you to survive. CLICK HERE AND GET 25% OFF THIS CRACKING EVERTON BOOK PLUS A PRESSIE OFF YOUR CHRISTMAS LIST! NOW £9.99 FOR A LIMITED PERIOD.